Bath flanker Andy Beattie has agreed a new two-year contract with the Guinness Premiership side. Beattie, 30, has made over 160 appearances for the side since joining them in the 2001-02 season, and he has described his decision to stay with the club as "one of the easiest decisions I have ever had to make". 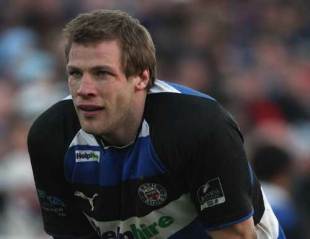 "In the last 20 years Bath has won some good silverware and I believe we are heading back in that direction," he said. "We finished in the top four of the Guinness Premiership last year, we are back in the Heineken Cup and we are going to be pushing hard for some more silverware. Hopefully it will be this year. "It was one of the easiest decisions I have ever had to make in my life. When I knew Bath was keen to re-sign me I jumped at the chance." Bath head coach Steve Meehan has expressed his pleasure at seeing Beattie re-sign at the Rec. "I am very happy to see him stay," said Meehan. "I think that his form last season, before his injury, was excellent and since he came back this season he has been very enthusiastic and playing very well. He is also a popular member of the squad and a very under-rated blind side flanker in this competition."